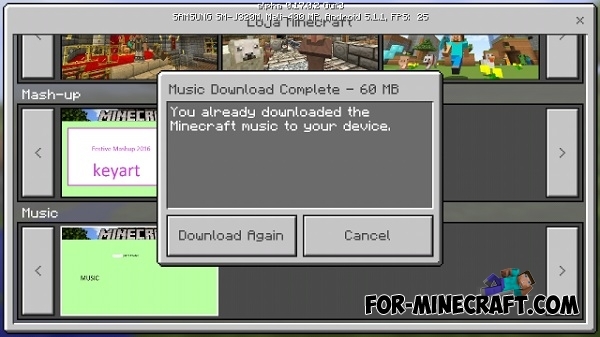 Unfortunately, the developers haven't added background music in the Minecraft PE unlike Minecraft PC. Without music, the game becomes a bit boring and monotonous. But with the help of this file, you can add background music and play with the sounds of musical instruments. File size is 60mb includes most of the songs from the original game. Now, when you get to the End and start battle with the boss, you will hear the new music. If you win, you will hear music during the credits. Copy "vanilla_music” folder here: Games / com.mojang / resource_packs. Then start the game and after a few seconds you will hear music. Eu gosto muito de Minecraft.